Hi, I'm Pixie. 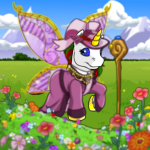 The Three Thousand Neopoints series is about only using 3000 NP to buy a certain number of books, or buy a certain amount of plushies-with no help from The Discarded Magical Blue Grundo Plushie of Prosperity, The Soup Faerie, The Healing Springs Faerie, The Giant Omelette, and so on. This edition is about the staple we know as food. I'm going to try to feed my neopets three square meals, a morning snack, and an afternoon snack. It also includes any food I buy during the course of my day. And of course, the meals must be actual meals and not just a hodgepodge of things from my SDB. This is also a really good way of teaching yourself how to save neopoints, so you should try this. Okay, breakfast! It's the most important meal of the day, so I'm going to start my Neopets off right. I got two Hasee Puff Cereals, which I found at 10 NP each, for Sugar and Rainey, and two Space Faerie Cereals, which I found at 25 NP each, for Maria and Gearrin. That brings my total NP down to 2930. And we need some milk for the cereal, and my neopets like the chocolate milk glasses they sell at Neopian Fresh Foods, so I bought some Mystery Island Chocolate Milk Glasses at about 10 NP each in a quaint user-owned shop for them. And eggs on toast are a staple in our household, so we had some Scrambled Eggs on Toast at 10 NP each. So I have 2850 NP now. And since no breakfast is complete without fruit, we got Tchea Fruit (at 2 NP), which is their favorite dessert fruit for. I mean, why have just a banana or a blueberry when you can have both combined in the Tchea Fruit? We finished up breakfast with 2842 NP. Next on our itinerary, we headed to the petpet petting zoo, which I hoped wouldn't drain any more of my food neopoints. I'd planned a morning snack for later that morning, but to no avail. They clamored for seeds to feed the Beekadoodles so I had to get them all a Pack o Pumpkin Seeds (6 NP apiece) so they could feed the petpets. Then, they wanted Cotton Apples, so I got two and made them share. We made it out having spent 74 NP. I'm just thankful they didn't ask for Kau Kau Farm Milk (very expensive) so they could feed the Zebies. We headed out of the zoo for a minute for a morning snack at about 10:30 AM NST. I bought four Garlic Cheese Toasts at about 40 NP each and a Bottle of Ketchupmayomustard (190 NP) to go with it.. Then, they started clamoring for something to drink, and water just doesn't cut it, so I got a Lime Milkshake (10 NP), a Vanilla Milkshake (200 NP), Cheops Juice (45 NP), and a Rainborific Slushie (70 NP). In all, that came to 675 NP, but it was worth it, 'cause it tasted good. So we had 2093 NP. Then we went back in and saw more petpets and had a lot of fun. We just got back from the petpet petting zoo and boy, are these 'pets hungry. So, an Apple and Cheese Sandwich (13 NP) for Gearrin, a Healthy Veggie Deluxe Sandwich (10 NP) for Maria, an Egg Salad and Cheese Sandwich (17 NP) for Rainey, and a Peanut Butter and Jam Sandwich (190 NP) for Sugar. And four Vials of Pure Water (3 NP each) to drink because I 'm running short on drink choices. Of course, we've got to be healthy, so Endless Salad and Bread Sticks, which, despite its name, does end, for all four of these hungry youngsters (each 20 NP). And a little treat for them: Nutty Chocolate Brownies (20 NP each)! I would've gotten Tyrannian Brownies, as they are cheaper, but you never know what they put in those things. And after all, isn't spoiling their 'pets what an owner's supposed to do? Yum! We are headed to Roo Island right now to have some fun playing games in the games room, and read a poem or two. I don't think we'll spend any food NP here. At least I hope not. I only have 1691 NP left, and my neopets are used to large, buffet style dinners with huge variety, so I better go do some research for dinner! Don't mind my previous comment. I got some hot Pumpkin Mocha (7 NP) for all of us. Because SOMEBODY forgot their mittens, and Roo Island is actually quite cold during the winter. Dinnertime! It's the holidays, so as an appetizer, I got two shish kebabs of Christmas Tree Rice Dumplings (150 NP apiece) which my 'pets are sure to love. I found four cheap Hero Gyros at only 3 NP per gyro, which is great! Spaghetti is also great so I got two platters of Pteri Spaghetti (300 NP per platter), which, despite the common belief, is not just for Pteris. We're getting fancy for dinner; we're having Hot Apple Cider (a cheap 10 NP per glass). OH NO!!!! I only have 773 NP for dessert... gah! This challenge is harder than it seems! Lavender Ice Cream, which is an awesome Altadorian dessert, (10 NP apiece) seems good. And you definitely need four delectable Slices of Lemoran Pie (30 NP a slice) to plop the ice cream on top of. And to celebrate the holidays and my money-saving abilities, four Snowflake Cakes are just what we need at 140 NP. And I've just hardly made the cut, finishing with 23 NP. Now that is what I call impressive. At least, for myself. Here are my neopets' comments about today. Well, then, I consider today a success. I normally feed my pets this amount of food, but I am certainly not frugal on other days.